Friends, family and community residents to pay tribute to Houston area leader while generating support for local charity, The Glenda Jean Mostyn & Joe E. Moreno Educational Foundation. 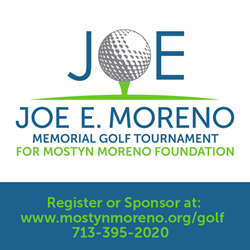 The Family of the late State Representative Joe E. Moreno is announcing the inaugural Annual Joe E. Moreno Memorial Golf Tournament to be held on Monday, June 15, 2015, at Quail Valley Golf Course, 2880 La Quinta Drive, Missouri City, Texas. A shotgun scramble start is expected at 1:00 p.m., followed by a dinner and auction with awards and prizes. Almost ten years have passed since District 143 State Representative Joe E. Moreno was tragically killed in a car accident. In that time, Joe Moreno has been immortalized by the naming of a local HISD elementary school in his honor. Mr. Moreno was also honored by the creation of an educational foundation bearing his name, The Glenda Jean Mostyn & Joe E. Moreno Educational Foundation (Mostyn Moreno Foundation), which supports, promotes and operates programs, projects and collaborative efforts in Texas, primarily in the East, Southeast and the Gulf Coast regions that serve to encourage the abilities of children with special needs. These two entities will be the beneficiaries of the proceeds collected through the golf tournament. The Mostyn Moreno Foundation was created in 2006 by successful Houston trial lawyers Amber and Steve Mostyn to honor the memory of two caring and generous Texans: Glenda Jean Mostyn: mother, grandmother, sister and educator in East Texas and Texas State Representative, Joe E. Moreno: son, brother, friend and legislator. Both cared very deeply about education and providing the best for the children of Texas. The Foundation’s focus is specifically on children with special needs and supports our community through the “Christmas Lights” program - an experiential life skill training program, a “Community Connections” program – a special needs child assistance program for families, a “Rodeo Day” – Ritch’s Little Raiders rodeo extravaganza, and the “VIP Day” program – a high school students’ self-esteem improvement effort. On May 6, 2005, 39-year-old Moreno passed away due to an automobile accident. He was elected in November 1998 to serve in the Texas Legislature from House District 143. Representative Moreno was experienced both as a legislator and staff member in the Texas House of Representatives. He previously worked as a Legislative Aide for former District 143 State Representative Al Luna, as well as serving as Chief of Staff and Campaign Manager for State Representative Jessica Farrar (Houston). As a long-time activist in helping to improve his community, Representative Moreno had been involved for many years in the Resurrection Catholic Church, Harris County Tejano Democrats, and the League of United Latin American Citizens Council Number Sixty. He had also held the position of Harris County Precinct Judge for Precinct 62. For more information on the event or how you or your organization can help please contact Monte Osburn at 713-395-2020 or mosburn(at)mostynmoreno(dot)org or http://www.mostynmoreno.org/golf Media coverage is welcome and appreciated.